Mike Fox recalls some of the challenges posed by a site which will house one of the most distinctive new developments in Bath. Delivering development in a World Heritage City is rarely straightforward. There can be no doubt that Bath offers a tranquil living environment for most of its 84,000 residents. However, it is rarely so restful for those bold enough to take on the challenges of development within one of the world’s most protected cities. Nonetheless, for those with the vision, passion and ambition to take it on, it can deliver spectacular results for all concerned. And so it is for Acorn, a residential developer with a reputation for delivering sensitive, bespoke developments that trade on quality over quantity. Nash Partnership was employed by Acorn as both architects and planning consultants to steer through a series of amendments to an extant consent, originally secured by Square Bay on appeal in early 2015. Upon purchasing the site, Acorn recognized that the extant permission delivered a sub-making the most of the site’s potential. As a result, our planning team was tasked with steering through a range of design changes while allowing development to commence as soon as possible. This turned out to be a complex task. 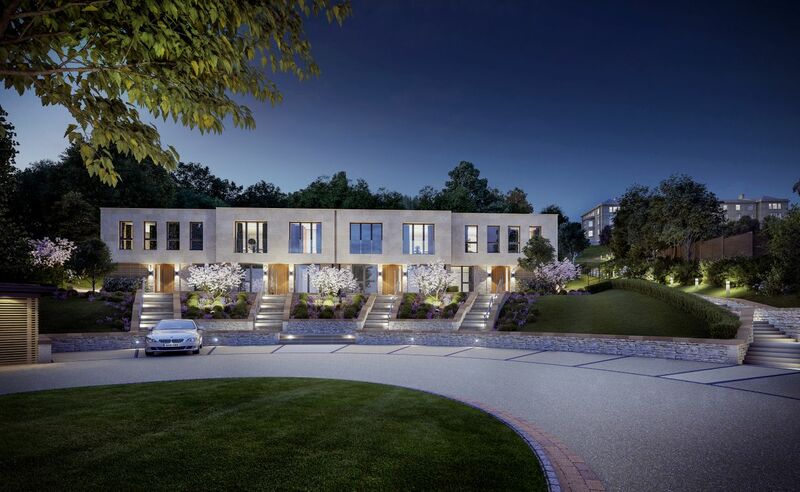 Our planning team worked with the architects and the client to understand the design ambitions and tailor a planning approach that would allow development to start on site quickly, while allowing the proposed changes to progress through the planning system in parallel. From the outset, the team sought to work collaboratively with the Council to ensure that a strategy could be devised that recognized and responded to the Council’s concerns up-front, while enabling Acorn to start work quickly and efficiently. Using a Planning Performance Agreement to ensure a structured engagement process, it quickly became apparent that the extent of the changes required would necessitate a new application. However, to bring forward development as quickly as possible, it was agreed that Acorn could discharge the pre-commencement conditions on the extant permission at the same time. The process ran smoothly until a small number of contentious issues arose, the most significant being the Council’s request for an education contribution via a S106 Agreement, in addition to the standard Community Infrastructure Levy (CIL) requirements. In parallel with the escalating construction costs arising on what is a highly complex development site (including the discovery of a World War 2 bomb, no less! ), it soon became apparent that the viability of the development was under threat. Robust discussions ensued between Acorn’s team and the Council, culminating in the commissioning of a viability appraisal. This was followed by lengthy negotiations involving independent viability consultants on both sides, to ensure that what has now secured consent can be delivered. This included negotiations over S106 contributions, including affordable housing. After a long process, Acorn and the design team have now secured consent for a planning permission with CIL requirements but only nominal S106 contributions, due to escalating construction costs, interest on financing and the challenges posed by the site. However, this will ultimately ensure a distinctive, buildable scheme is delivered on one of the most spectacular sites in Bath. While this will not include any affordable housing, it will provide a valuable contribution towards meeting housing demand in this highly constrained city, offer a bespoke new development befitting of this unique site and deliver an outstanding living environment for those lucky enough to be living in one of the 58 homes. So, as they say, ‘fortune favours the brave’. Undoubtedly, Acorn’s persistence will be repaid in full when they deliver one of the most distinctive new developments in this fine city. Read more articles from Nash Review here.